Our Midwestern summer weather has finally cooled down to bearable temps and we're itching to get outside and play. That is just what Oregon company, "Outside Baby" is all about. They have exactly what we need to get out there and enjoy what mother nature has thrown our way. From technical playwear to an array of quality packs and bags, among other outdoor-type items, Outside Baby is where it's at. 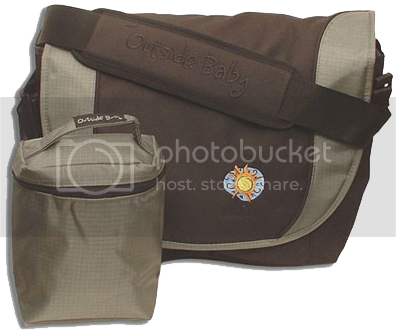 Outside Baby's packs and bags are made from waterproof rip-stop Nylon and Cordura. If you want to look like you know what you're doing out there on that rough terrain, you've got to have one of these! Hailey is sporting the mini backpack, just like mom and dad's! Next is the mini messenger bag, which works perfectly on your son or daughter's bicycle. 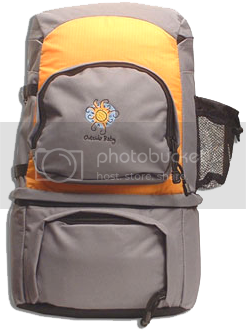 Then the cooler backpack, excellent for hiking. I find messenger bags hard to live without so definitely check out their messenger bag, complete with a travel cooler. Last but certainly not least, the hydro pack so you can stay hydrated at the park or on the trail! Outside Baby is really worth taking a look-see. Whether you're an avid outdoors-man or just taking the occasional stroll on the suburban trails, Outside Baby is a trusted source for quality gear. Feel free to let us know which one you'd like and we'll do our best to accommodate. Sign up for our weekly email newsletter HERE* AND leave a comment on this post letting us know where your favorite "outside" place is. Whether it's to the neighborhood park or hiking in the rockies...we want to know! Deadline to enter is Tuesday, September 4th at 10 pm CST. *If you are already signed up for our weekly email newsletter, you may still enter this giveaway. Just let us know you're on the list in your comment so we can verify it!